This weekend found me puzzling over patterns trying to find something just right to knit for my dear little neighbor Ian who is turning one on Saturday. Something sporty. Something international (he's already been to the Alps for goodness sake!). And something warm since he is happiest when outside. But no pattern in my collection would do. This little guy needed a hat as unique as he is. Since Ian has not received his present yet, our model is young David who is almost 2-years-old. He was not thrilled to be wearing this hat and thus, we have some blurry pictures. I will post pictures of Ian after Saturday. Enjoy the pattern and please send me any improvements, corrections, or comments about the pattern since it is my first! The pattern is written to fit a one-year-old – a 17 ½ inch diameter. You should be able to adjust the size by going up a needle size (medium) or by adding a pattern repeat (large). sl 2 tog k1 PSSO Decrease: Slip two stitches together knitwise, knit the next stitch, pass the slipped stitches over. 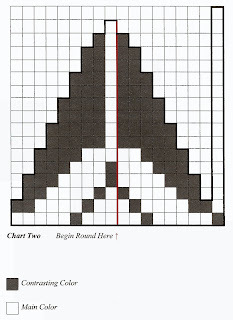 Execute this after the last pattern stitch on the right side of the chart. The knitted stitch in the decrease should always be in the MC. Single Crochet Bind-Off: Insert crochet hook into next live stitch on needle as if to knit, yo hook and draw loop through stitch, remove stitch from needle, *leaving loop on hook, insert hook into next live stitch, yo hook and draw loop through stitch (2 loops on hook), remove stitch from needle, yo hook and draw through both loops; rep from * until all stitches are bound off. CO 5 stitches in MC. Make 2 stitches on each side of every right side row until you have 15 stitches. 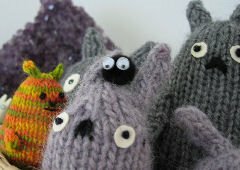 Knit until earflap measures 3 inches. Break yarn and place stitches on holder. Using a cable cast on, CO 77 stitches in Contrasting Color. Join for knitting in the round by slipping the first CO stitch from the right needle to the left needle and place marker on right needle. Purl this stitch together with the last CO stitch. Switch to MC. Knit 11 stitches. Attach the left earflap as with the right. Knit 11 stitches to finish the round. Knit 5 rounds then follow colorwork chart one, making sure to keep an even tension while stranding the yarns. Alert! Knit Chart One as if the red line was not there. Begin the round from the far right side of the chart. Knit in MC until hat measures 5 inches from CO edge. Still in MC, decrease 4 stitches evenly (k17 k2tog, repeat). Switch to CC. Knit 1 round, then purl 2 rounds. Switch to MC, Knit 1 round. Follow colorwork chart two using sl 2 tog k1 PSSO decrease (see notes). When 8 stitches remain, k2tog around – 4 stitches remain. Knit these 4 stitches as an i-cord for as long as desired. Break yarn leaving a 6 inch tail. Thread a tapestry needle with the end, slip stitches from dpn onto the tapestry needles and draw together. Fasten off. With 3 dpn, pick up and knit stitches along the right earflap in CC. Using a crochet hook and the single crochet method (see notes), BO all stitches. Attach earflap edging behind the CC brim of hat. Repeat for the left earflap. Weave in all ends and block well. 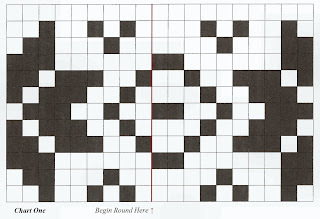 Begin round in Chart One on far right side. Ignore the red line and the words underneath. Doh! Follow the Chart directions for where to begin the round for Chart Two -- begin at the red line. I'll try to correct Chart One ASAP! Aaaaahhhhh! This is mean screaming with pride! What a gorgeous hat. Love it love it love it. Congratulations and I can't wait to try it. In the meantime, a bigger picture with Ian as the model would be great! how CUTE is that hat? the model is also a little charmer. man, with the temperatureas low as it is right now, EVERYBODY needs a hat like that. What a big step, Ann. Very proud! That is an awesome, not your run of the mill, kids hat. I love it! I am going to print your pattern so I have it on file for when I have a little more knitting bandwidth. Thanks for being willing to share your pattern. So cute! You did a great job on your pattern. It's very readable and looks easy enough to follow. HAHAHAHA! LOVE IT! Totally adorable. What a cute hat. Nice work. Thanks for sharing! Beautiful hat and I'm in the middle of knitting it. However, I can't figure out where in the second chart the decrease stitches are. Can you clarify? Just like Jennifer, I cannot figure out the decrease stitches either/how to follow the second chart. Do you make four decreases per row? I would find it helpful to know the stitch count at the end of each round for the second chart. There are a few problems with the pattern. 1) The directions for the decrease should read: "sl1, k1, PSSO" If you slip 2, the pattern is completely off. 2) In the "Hat Body" section, where it says "Knit 5 rounds then follow colorwork chart one" the pattern could be improved by creating rib here. K1, P1 for 4 rounds, knit the remaining round, then proceed as directed. 3) It would be helpful to list the number of stitches on each row where there is an increase or decrease. 4) On Chart 2, not every row is decreased, the exact positioning of the decrease is unclear, so make sure you work out the first pattern repeat BEFORE you begin knitting the row so you know where best to place the decrease and exactly which stitches to decrease on. The chart could have been drawn much better as those stitches were removed from the pattern.